One of my very favorite comfort foods is Chicken & Dumplings! My great grandmother used to make them, and I remember it being one of her specialties. It was always such a treat to enjoy a bowl of them. I decided to try to make some for my kiddos so that they could enjoy them too. 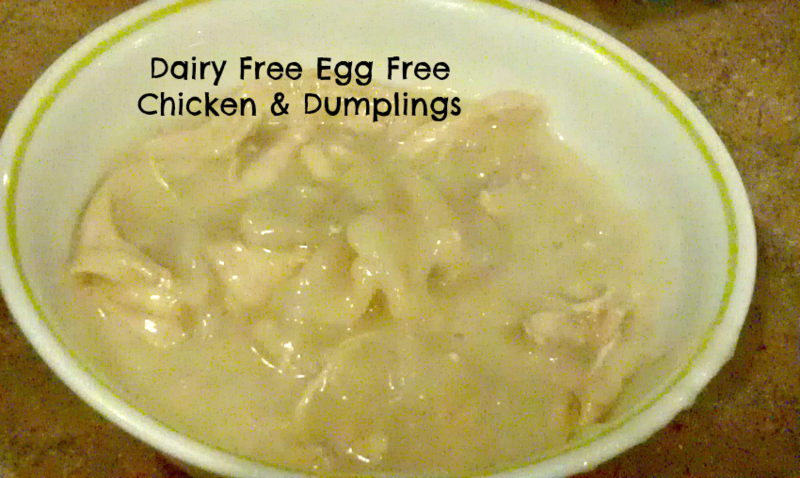 I have not been able to come up with a good dairy free egg free homemade dumplings recipe so I do cheat a little with canned biscuits, but they make it SO easy and So Yummy! 4 Cans Biscuits(10 count) - Read the label to make sure they are dairy/egg free. Pour Chicken Broth, Milk Alternative, and Water into Pot. Bring to Medium Heat (Do Not Boil).